We’d love your help. Let us know what’s wrong with this preview of Booked 4 Murder by J.C. Eaton. Sophie Phee Kimball is not a cop. She s a divorced, middle-aged mom who works as an account clerk for the police department in a small city in Minnesota. But her retired mother, Harriet Plunkett, is convinced Phee is the only one who can solve the mystery of a cursed book. According to Harriet, four members of her book club have already succumbed to the deadly curse. Harriet insists Phee catch the next plane to her retirement community in Sun City West, Arizona, to investigate. To ask other readers questions about Booked 4 Murder, please sign up. I entered the giveaway and never received the book. Did anyone else get their book? Louetta Waters I never received mine! Sophie Phee Kimball works in accounting at the police department so of course her retired mother thinks that should make her perfect to investigate a series of deaths in her retirement community. Sophie's mother is sure that her book club has been reading a cursed book when several of the club's members suddenly die. Sophie does her best to explain to her mother there is no such thing as curses but her mother won't let the matter go. After speaking with a detective friend at work Sophie decides Sophie Phee Kimball works in accounting at the police department so of course her retired mother thinks that should make her perfect to investigate a series of deaths in her retirement community. Sophie's mother is sure that her book club has been reading a cursed book when several of the club's members suddenly die. Sophie does her best to explain to her mother there is no such thing as curses but her mother won't let the matter go. After speaking with a detective friend at work Sophie decides the best thing to do is take some time off and go visit her mother, asking a few questions here and there wouldn't hurt, would it? After arriving Sophie begins to look into the deaths of the book club members and finds herself getting deeper and deeper into a plot that she never expected and trying to prove that there is no book curse. 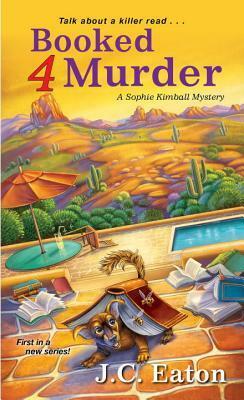 Booked 4 Murder is the first book in the new Sophie Kimball Mystery series by J.C. Eaton. This first edition to the series had all the great ingredients to a cozy mystery that I enjoy, a down to earth main character that follows the clues and questions those involved but with some connection to law enforcement to help with the harder aspects, likable characters and a fun environment for the story to take place. I thought Sophie and her mother had a great relationship and often found myself chuckling at their interactions. The retirement community in Sun City West, Arizona is exactly how I'd imagine it to actually be, the residents having their own way of doing things and quite set in their ways while keeping track of everyone else. Just a fun read with fun characters and would look forward to seeing what the author has in store in the future for Sophie and friends. At first, I wondered if I would like this book because the plot seemed really different, however; new author, J.C. Eaton, skillfully maneuvered the plot with a strong, logically thinking protagonist, Sophie 'Phee' Kimball, making the story irresistible for me. The clues are interspersed with humor making this a swiftly moving read. BOOKED 4 MURDER is a mystery too good to 4get! Starting a new book can be hard. When that book is the first in a new series? Well, it can be even harder. So, I started reading BOOKED 4 MURDER with high hopes, mixed with a bit of trepidation. My worries were for nothing. Author J. C. Eaton has created a great new mystery series. I was completely hooked from the first chapter. If this first installment in the series is an example of what is to follow, this series is going to run for a long time. I m BOOKED 4 MURDER is a mystery too good to 4get! I made a quick connection with series protagonist and namesake, Sophie Kimball. Sophie is middle aged, so I could relate better with her in some situations than I can a very young heroine. Her mother, Harriet is such a fun character. A lot of the scenes with her had me laughing. And Harriet’s dog, Freeman . . . well, I have a Chiweenie of my own, so author Eaton scored there with me. A wonderful mystery, BOOKED 4 MURDER had twists and turns, red herrings, and an all-round cleverness that had me guessing my way through this fast paced book. When the reveal came, I was surprised, even though I had guessed it earlier in the story, only to reject it. Give this new series a try. Pick up a copy of BOOKED 4 MURDER. When you’re finished, you’ll be waiting for book two, DITCHED 4 MURDER as anxiously as I am! I found the characters one-dimensional and not very interesting. This makes the book hard to rate. My rating is 3.5 stars. Phee works for the police department as an accountant in her hometown. Her Mother lives in Sun City West, Arizona and belongs to a book club. The monthly book selection rumor that there is a curse on anyone reading it. Four members of the club have died after reading it. Phee's Mother pleaded with her to come out and investigate the curse. Phew arrives to find the fifth member recovering from carbon monoxide poisoning. She had read the book. Phee is looking for answers to these questions: Were the deaths natural or are they murder? (Evidence suggested they might be murder). Who manipulate the book from almost no sales to a number one seller? Phee has a number of adventures before she finds the answer. For dog lovers, there are few adventures at a dog park. The ending is creative and it will surprise you. The actual perpetrator surprised me. I will read the next book. I can't believe I waited so long to read this book! I was sucked in from the very beginning and could barely put it down. Phee and her mom were such great characters together, yeah maybe her mom is a tad annoying but isn't everyone's a little that way? The person I guessed was not the perp, and I even went for a kind of obscure person. Sophia "Phee" Kimball got a call from her mom, frantically saying that the book their book club was reading was cursed since three people had already died after r I can't believe I waited so long to read this book! I was sucked in from the very beginning and could barely put it down. Phee and her mom were such great characters together, yeah maybe her mom is a tad annoying but isn't everyone's a little that way? The person I guessed was not the perp, and I even went for a kind of obscure person. Sophia "Phee" Kimball got a call from her mom, frantically saying that the book their book club was reading was cursed since three people had already died after reading it. Phee tried to reason with her mom but she knew early on she'd end up down in Arizona from Minnesota. Phee's good friend, Nate, a detective with the police department where she was in accounts receivable, encouraged her to go. He said she always did such a good job of tracking down receipts and things like that, she'd be a natural for investigating. Phee didn't really know where to begin, but with Nate's guidance, she soon had a lot of good information, including what her mother had written down for her before she got there. I loved how Nate and Phee would share info and how he'd get the tech guy helping her. It was kind of refreshing not to have the main character worrying about which guy she likes, and instead have the male character she's interacting with be 20 years older and more her mentor. That gave her time to be more concerned with finding out the answer to what ended up being a whole trail of secrets and puzzles that led to the senior ladies' deaths. Was it murder or was someone using the supposed-curse to their advantage? Who would want to off these sweet old ladies? You'll have to read and find out. You'll be surprised and pleased with the ending. Phee somewhat got to Miss Marple and Poirot her findings, but that final book meeting/reveal was pretty hilarious at times. A winning first book in a series, Booked 4 Murder is the start to a series that i am sure to continue reading! Sophie was an absolutely wonderful character. She wasn't young, there was no love interest at all (which was amazing! ), and she blatantly investigated. Three things that are atypical, but that--combined together--worked! Sophie's mother wasn't sassy or crotchety, another deviation from the typical cozy mold. Booked 4 Murder is the first book in a new cozy mystery series! Sophie Kimball, at almost 45, is enjoying her life. She works for the Mankato, MN Police Department in accounts receivable. Her daughter is in college and her mother has moved to Arizona. Her life is pretty well set. Peaceful. Until......members of her mother's book club start dropping dead after reading their book selection for the month, a little known self-published tragic romance, The Twelfth Arrondissement. Sophie's mother, Har Booked 4 Murder is the first book in a new cozy mystery series! Sophie Kimball, at almost 45, is enjoying her life. She works for the Mankato, MN Police Department in accounts receivable. Her daughter is in college and her mother has moved to Arizona. Her life is pretty well set. Peaceful. Until......members of her mother's book club start dropping dead after reading their book selection for the month, a little known self-published tragic romance, The Twelfth Arrondissement. Sophie's mother, Harriet, immediately calls her daughter, demanding she come to Sun City West to investigate. The book must be cursed! Can Sophie discover what happened the four book club members who died? Is the book really cursed? Or were they victims of foul play? I love this book! The relationship between Sophie and her mother is a hoot! Sophie keeps saying she isn't a detective that she handles accounts receivable not investigations, but her mother keeps demanding that if she can hunt down receipts that she can solve the mystery of the cursed book. Both women are intelligent,independent and stubborn! And they love each other, despite a bit of grousing. The side characters in this story are quirky and charming. I love the retirement village setting where residents fight over bingo, wreck golf carts and vie for the best sun chairs at the pool. I had to look up the definition of arrondissement...but I didn't feel bad because characters in the story admitted they didn't know what it means either. The mystery portion of the plot is interesting and different. There are several suspects and scenarios that keep the reader wondering, and plenty of action to keep the suspense going. I enjoyed reading about a middle-age sleuth....no romance with a local cop or other overdone tropes. This story was new, refreshing and different. Plenty of humor. Great side characters. All in all, a fun read and a great start to a new series! J.C. Eaton is the pen-name for this collaborative effort between writers Ann I. Goldfarb and James E. Clapp. I will definitely be reading more of this new series! Luckily, the second book in the Sophie Kimball Mysteries series, Ditched 4 Murder, will be available in December 2017! Not long to wait!! Booked 4 Murder is the first book in the A Sophie Kimball Mystery series. Booked 4 Murder is a very enjoyable beginning to, what I think, will be an entertaining series. If you like a good helping of humor with your mysteries, this is definitely a book that should go to the top of your to-read list. A fast paced book with a wonderful cast of characters. The book is set in Sun City, AZ, a retirement community with a group of retired seniors, who are set in their ways but still are alert enough to Booked 4 Murder is the first book in the A Sophie Kimball Mystery series. Booked 4 Murder is a very enjoyable beginning to, what I think, will be an entertaining series. If you like a good helping of humor with your mysteries, this is definitely a book that should go to the top of your to-read list. A fast paced book with a wonderful cast of characters. The book is set in Sun City, AZ, a retirement community with a group of retired seniors, who are set in their ways but still are alert enough to watch out for their friends. The story, along with the characters, makes me want to call this a combination of Columbo and the Keystone Cops. Sophie finally gives in to her mother’s request, putting it mildly, to come to Sun City to investigate the deaths of three members of her mom’s book club. He mom is sure that deaths are the result them reading a “cursed” book. As Sophie arrives at her mother’s there is a police presence across the street. It is soon learned that there was carbon monoxide poisoning, but it was found early enough that the homeowner survived. Sophie works in the accounting department of the Mankato Police Department, so she has no real investigative skills, but she does have common sense which she uses to look into te suspicious deaths. She feels that at least two of the deaths are simply accidents, But the death of one the members from a bee sting and the attempted death by carbon monoxide poisoning have her stymied. In addition, Sophie is also perplexed that she can find anything about the book or it’s author. Sophie contacts Nate Williams, a detective with the Mankato PD to asks procedure questions and whatever information he might be able to get to help find the killer. An excellent first book in the series. I loved how well written this was. A ton of action and mystery. Loved the characters and the creative title and story. Love that gorgeous cover, I mean its one of the best Ive seen in a while! Fun start to a new series! I will definitely be reading more books by this author. The relationship between the main character Sophie and her mum Harriet is so much fun! I found myself chuckling along at their interactions and not wanting the story to end. Any book involving books will always be on my list of books I WILL get to very soon and I thoroughly enjoyed this wander to Arizona, settling in to pretend I'm with them in the warmth but knowing I ain't gonna get murdered and if I am, they can help find the killer. Book 2 is waiting on my kindle, yay! *Huge thanks to J.C. Eato The relationship between the main character Sophie and her mum Harriet is so much fun! I found myself chuckling along at their interactions and not wanting the story to end. "I'm telling you, Phee, they were all murdered." Sophie "Phee" Kimball is an accountant for a small Minnesota police department. Her mom convinces Phee to come to Sun City West, Arizona to help her discover who is killing off book club members. This book has a ton of characters. I almost needed a spread sheet to keep up with them. The book club is reading an obscure book that seems to relate to several recent deaths. Phee starts picking up real clues which lead back to a dastardly plot. This was ju "I'm telling you, Phee, they were all murdered." This was just an ok book for me. There was too much going on for it to be cohesive. I did enjoy Phee's willingness to find the answers. Everything else was just too over the top. I'm not sure that I would read the next book in the series. A great kickoff to a new series! This story written by husband and wife, James E. Clapp and Ann I. Goldfarb is set in a senior community in Sun City West, Arizona, and is often laugh out loud funny. The rest of my time was spent [figuratively] shaking my head at the antics of these characters. I can't wait to see what happens next in book #2 in this series, Ditched for Murder!! Booked 4 Murder, by J C Eaton has everything I like in a cozy - a mystery that keeps you guessing, humor (Mother and the book club crew were hoots! ), a relatable heroine who had life experience and of course, a wonderfully crabby little dog! Phee Kimball is a good daughter. When her mother calls Phee with the news that her book club has started reading a cursed book and the members are dropping like flies, Phee is on the way to sunny Arizona to find out what's happening. The final showdown in th Booked 4 Murder, by J C Eaton has everything I like in a cozy - a mystery that keeps you guessing, humor (Mother and the book club crew were hoots! ), a relatable heroine who had life experience and of course, a wonderfully crabby little dog! Phee Kimball is a good daughter. When her mother calls Phee with the news that her book club has started reading a cursed book and the members are dropping like flies, Phee is on the way to sunny Arizona to find out what's happening. The final showdown in the library was classic and the Helen of Troy reference to a curse victim, made me snort! Booked 4 Murder was a delightful read. I loved every page. The characters were likable and entertaining. The mystery plot was humorous, but also well crafted. The surprise ending blew me away. I quickly started the second book, Ditched 4 Murder. Treat yourself to a fun book and read Booked 4 Murder. I absolutely enjoyed this book. It was a cute, quick read that kept me guessing until the very end. I loved all the twists and turns. I enjoyed Booked 4 Murder by J.C. Eaton. The book was funny and entertaining. I look forward to reading more in this series. I've been on a roll with fantastic cozies this year but the last few have been a little flat. However, as soon as I started this one I knew my luck was changing. This mystery was so much fun! Phee is not your typical amateur detective. She's a little bit older than usual and while she does work for the police department her primary investigations involve tracking down receipts and she likes it that way. She has no interest in solving a mystery that she's pretty sure is amazing until a friend (w I've been on a roll with fantastic cozies this year but the last few have been a little flat. However, as soon as I started this one I knew my luck was changing. This mystery was so much fun! Phee is not your typical amateur detective. She's a little bit older than usual and while she does work for the police department her primary investigations involve tracking down receipts and she likes it that way. She has no interest in solving a mystery that she's pretty sure is amazing until a friend (who happens to be a police detective) convinces her that there might really be something more than a combination of boredom and a vivid imagination. Phee puts some serious legwork into the investigation and it was really fun to watch as she figures out who to talk to and how to talk to them in a way that isn't too big of a lie but that will make people answer her questions.She's a smart investigator though not flawless and chases down some dead ends and false leads. It was a ton of fun following all the clues right along with her. The community of Sun City West is not the sleepy little retirement community that Phee thinks it is in the beginning. There's all kinds of gossip and politics and the dynamics for events is seriously complicated but very entertaining. The mystery itself is well done and while I had guessed bits and pieces the way everything came together was a surprise. This is one of my favorite cozies of the year so far. It's on the light side but not silly and I really enjoyed the characters. It was a very quick read and kept me entertained. There's a little setup for the rest of the series at the end and I'm super excited to see where the next book goes. I read this book for a facebook bookclub I am in, and am so glad I did. Sophie, aka Phee, gets a frantic call from her mother. The book they are reading for their bookclub is cursed and she wants Sophie to come out to Arizona and help her find out what is going on. Sophie is not a cop, but works for the Mankao Minnesota police department. With reluctance, off she goes. Phee didn't really know where to begin, but using the information her mother has already gathered, she was able to make a plan. I read this book for a facebook bookclub I am in, and am so glad I did. Sophie, aka Phee, gets a frantic call from her mother. The book they are reading for their bookclub is cursed and she wants Sophie to come out to Arizona and help her find out what is going on. Sophie is not a cop, but works for the Mankao Minnesota police department. With reluctance, off she goes. Phee didn't really know where to begin, but using the information her mother has already gathered, she was able to make a plan. Occasionally getting help from her friend Nate, who is a police detective, she stumbles onto clues, and begins to figure out what is going on. Loved Sophie Kimball! Great first book in a series. Having to go to Arizona on the crazy whim of her mother is not Sophie's idea of a vacation. Her mother is convinced there is a book curse causing members of her book club to die. Now Sophie has to play sleuth to find out. A wonderful story that mystery readers will want to read. The next one is on my must-read list. This book had me laughing, busting at the seams, literally. It was such a fun and refreshing read and the characters were really bright and active. The plot with 4 deaths was very curious and then to tie it all in with a curse? it really had you wondering what was going on! It was very well written and I know the next one will be just as enjoyable! Booked 4 Murder is the first book of a new cozy mystery series by J.C. Eaton. It follows Sophie Kimball as she travels from Missouri to Arizona to help out the world's most annoying mother. Sophie, or Phee as everyone calls her, works for the police department, but in accounting. Her mother calls her and demands she come to her home to investigate a series of deaths. When Phee's mother tells her in the first few pages: “I’m telling you, Phee, they were all murdered. Murdered by reading that book Booked 4 Murder is the first book of a new cozy mystery series by J.C. Eaton. It follows Sophie Kimball as she travels from Missouri to Arizona to help out the world's most annoying mother. Sophie, or Phee as everyone calls her, works for the police department, but in accounting. Her mother calls her and demands she come to her home to investigate a series of deaths. When Phee's mother tells her in the first few pages: “I’m telling you, Phee, they were all murdered. Murdered by reading that book.” I knew we were in for something fun. And when her mother tells her they got emails saying: "Death lurks between the lines,” I was ready to go along for the ride. The allegedly cursed book, a self-published tome entitled The Twelfth Arrondissement was chosen at random from suggestions of the group to be the book club reading for the month. Four people died, and another had an attempt on her life while reading it. Of course, when you consider that the people in the book club all live in a retirement community, the death rate seems a little less alarming. But not to Phee's mother, Harriet. And so Phee finds herself in Arizona in the summer running around a retirement community. Booked 4 Murder is the debut book in J.C. Eaton’s Sophie Kimball Mystery series and is a well-written, steady paced and humorous whodunit, with well-developed and likeable characters. This is a fast and fun read. There are enough suspects, twists and turns, and red herrings to keep the reader engaged. I recommend this book to anyone who enjoys reading fun, well-crafted cozy mysteries. I’m looking forward to reading the next installment, Ditched 4 Murder, in this series. Sophie ‘Phee’ Kimball is a Booked 4 Murder is the debut book in J.C. Eaton’s Sophie Kimball Mystery series and is a well-written, steady paced and humorous whodunit, with well-developed and likeable characters. This is a fast and fun read. There are enough suspects, twists and turns, and red herrings to keep the reader engaged. I recommend this book to anyone who enjoys reading fun, well-crafted cozy mysteries. I’m looking forward to reading the next installment, Ditched 4 Murder, in this series. Sophie ‘Phee’ Kimball is a divorced, middle-aged mother of an adult daughter, who works as an account clerk for the police department in Mankato, Minnesota. She receives a call from her mother, Harriet Plunkett, who lives in a retirement community in Sun City West, Arizona, demanding she come and solve the mystery surrounding what she claims to be a cursed book that her book club, Booked 4 Murder, is currently reading. Harriet is convinced the cursed book has caused four deaths and one narrow escape for book club members. Even though Phee has no investigative experience, Harriet believes she’s the only person who can solve this mystery. Phee tries to convince her mother that no one drops dead from reading a book but knows her mother won’t stop nagging her, so she reluctantly books a flight to Arizona. Phee and her mother, with the help from Phee’s friend, Detective Nate Williams, and Rollo Barnes, a talented hacker, work together unravel the complex mysteries involving the book club. This is a fabulous first in series by a husband and wife team! The setting is Sun City West, Arizona, and I live very close to it. Loved reading street names and restaurants that sound familiar. The plot has an abundance of twists and turns right through the very end, reminding me of a ball of yarn that several kittens have a battle with. The authors, however, have it well under control at all times and execute it with finesse. Phee (Sophie) Kimball is an accountant with the police department in This is a fabulous first in series by a husband and wife team! The setting is Sun City West, Arizona, and I live very close to it. Loved reading street names and restaurants that sound familiar. The plot has an abundance of twists and turns right through the very end, reminding me of a ball of yarn that several kittens have a battle with. The authors, however, have it well under control at all times and execute it with finesse. Phee (Sophie) Kimball is an accountant with the police department in Mankato, Minnesota (where the Ingalls family had lived for a few years). This, to her mom's way of thinking, qualifies her to come to Sun City West for an early visit before she gets bumped off by the book curse surrounding her book club's monthly choice. Four women had died, each by different causes, and the night that Phee flew in to Phoenix, another had almost died. What ensues from there is a superbly planned grand mystery jaunt through Sun City West. Phee, sometimes directed by or with her mother, gets into some of the most uncomfortable spots - dumpster diving, water aerobics, even Bingo games where the players had their troll dolls and other lucky charms cluttering the tables. Trying to discover the source of each tentacle of the mystery even as more grow seems like a never ending task. But Phee and Harriet, her mother, are determined to find the solution and stop the deaths before Phee returns to Minnesota. This superbly written novel is planned and executed with precision. There are so many tentacles to the mystery that I am impressed that every detail is addressed, leaving no open ends. The dialog is realistic, as is the action. I could not, no matter how hard I tried, find an explanation or culprit or motive for every single situation! I was happy to have just solved a bit of the puzzle! I highly recommend this cozy mystery! Especially for those who enjoy being challenged, enjoy a Southwest setting, and appreciate the humor throughout. This is a "not to be missed" novel.